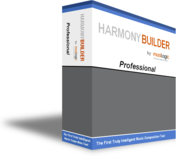 HarmonyBuilder (Professional) is a music composing software program that combines the power of automated error-checking with the convenience of smart composition tools, like the Chord Selector wheel and the Voicing Generator. The Builder panel allows compositions to be developed either harmonically, by following the chord progression pathways suggested by the software, or melodically, by selecting from the menu of all chord options that harmonize a given melody or bass note. Either way, the end result will be perfectly voiced chord progressions that match your chosen melody line, bass line or modulation requirements. You can also specify chord inversions and note doublings. HarmonyBuilder (Professional) is also a great learning tool for music theory, harmony and counterpoint, since it provides instant visual and aural feedback about chords, inversions, voice-leading, modulation and many other building blocks of music. Song-writers looking for interesting new chord progressions. The Professional version incorporates all the elements of the Basic and Educational versions.